yoga retreats in nicaragua BlgWorld-SmallPlanet Retreats for those who choose to experience Nicaragua as their next wellness destination, bigworldsmallplanet.com ama tierra yoga retreat & wellness center in costa rica individual and group retreats, nourishing organic diet, and new yoga and spa-treatment facility. Group incentives! Email [email protected], call (866) 659-3805, or visit AmaTierra.com. bolivian andes & amazon ECO-IOdges, retreat centres, cultural & spiritual sensibilities. Travel, adventure, culture, therapies, rituals, yoga courses, intensive shamanic training. Live in native communities, socially responsible tourism. Email [email protected]. Call (591) 72002055 or fax (591) 22745265. boliviamistica.com devipuram Devi shrine with the largest Meru on earth. Unique & visionary Sri Vidya teachings online/site. Scientist-turned-guru Amritananda's powerful 45-mlnute Srichakra meditative prayer, Freedom Ritual for everyone. Bring Divine harmony into your life; visit devipuram.com. mark wh1twell in fiji A blissful week in the South Pacific. Call (61) 2 9969 4753 or visit YogainFiji.com. 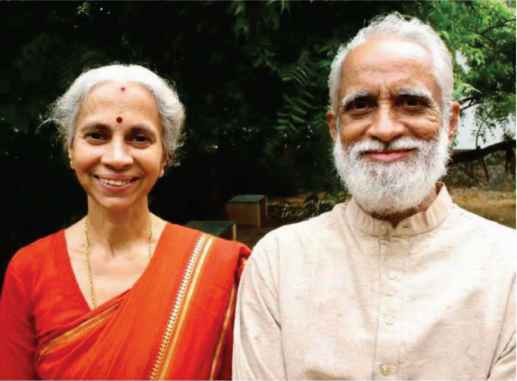 Forfour decades A. G. and Indra Mohan together have explored the wisdom of yoga as a path to inner peace. An amusing storyteller, A. G. Mohan often recounts comical and profound moments from his 18 years of study with SriT. Krishnamacharya, who is known as "the father of modern yoga." Mohan's new book, Krishnamacharya: His Life and Teachings (Shambhala Publications, 2010), offers a loving remembrance of those years. With his wife, Indra, Mohan travels internationally, teaching the Yoga Sutra and other yoga texts. With tbeirsonGanesh, the Mohans founded Svastha Yoga and Ayurveda, based in Chennai, India. How did you meet Krishnamacharya? A, G.iWcmcthiminigyi — the same year we were married. I was 25 years old and had degrees in engineering and management and a good job. I also had a strong interest in spirituality and so attended one of Krishnamacharya's lectures. He was 82 but seemed much younger. He stood straight and still like a statue and spoke without hesitation. I was spellbound. By 1978,1 had quit my engineering job and devoted myself full time to studying with Krishnamacharya and teaching yoga. You often teach Patanjali's Yoqa Sutra. Why do you emphasize that? A. G.: Yoga is a "do-it-yourself" path. No one can give peace to you. But the Yoga Sutra showsprn how to find it. Patanjaii tcachcs from experience and shows us what we need to do if we want to Steady out minds and live in pcacc. We don't offer ongoing classes. Sri Krishnamacharya emphasized that the practice has to be personalized. When we look at agroup of students, we see that the needs of each one are different. So we focus on individual practice rather than agroup practice. However, we do teach some group as ana c lasses during seminars. You've been studying together and teaching as a couple for many years. What is that like? Indra; It has been a great journey for both of us. We are very fortunate and blessed to have similar interests in life. It is very fulfilling to study and discuss the timeless message of the great seers and then to share this knowledge with interested students. Prevention has always been the most effective approach to good health, and with Dr. Ohhira's Dietary Supplements, it's never been easier. Wherever you go, take Dr. Ohhira's products with you. Find Dr. Ohhira's Formulas at better health food stores nationwide. Dr. Ohhira's Probiotics " is a registered trademark of Essential Formulas Incorporated.